The Roasted Pineapple & Habanero sauce from Costco is smothered in these chicken kabobs, creating a smokey, sweet and spicy melody of flavors. I was a little impressed by the sweet pineapple-y taste with a slight hint of spiciness going on, that after trying a sample of the Roasted Pineapple & Habanero sauce at Costco, I ended up purchasing it. 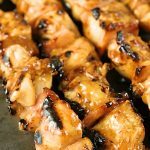 To make chicken skewers, I pureed the sauce along with some bbq sauce (which adds some nice smokiness) and then coated the meat pieces to soak up some of those flavors. If you like sweet and spicy combinations, give these Grilled Chicken Kabobs a try! 1. Puree the Roasted pineapple sauce with bbq sauce in a blender, just until smooth. Set aside. 2. Season the chicken chunks with salt and pepper to taste. Pour the pineapple bbq sauce over the chicken (reserving 1/3 cup for basting afterwards) and toss the chicken pieces to coat. 3. Preheat grill to high heat and start threading the kabobs onto skewers, alternating with bacon and chicken pieces. 4. Place Kabobs onto the grill and cook for 2-3 minutes without turning. Then flip, reduce heat to medium and baste with the reserved sauce. Repeat with the other side and glaze both sides before serving. The Roasted Pineapple & Habanero sauce from Costco is smothered in these chicken kabobs, creating a smokey, sweet and spicy melody of flavors. Puree the Roasted pineapple sauce with bbq sauce in a blender, just until smooth. Set aside. Season the chicken chunks with salt and pepper to taste. Pour the pineapple bbq sauce over the chicken (reserving 1/3 cup for basting afterwards) and toss the chicken pieces to coat. Preheat grill to high heat and start threading the kabobs onto skewers, alternating with bacon and chicken pieces. Place Kabobs onto the grill and cook for 2-3 minutes without turning. Then flip, reduce heat to medium and baste with the reserved sauce. Repeat with the other side and glaze both sides before serving.